This series of tractor is a new model based on the 1.2m tread, two wheeled drive TY tractor, which takes the model 400 triangle rubber crawler to instead of the normal driving wheels. 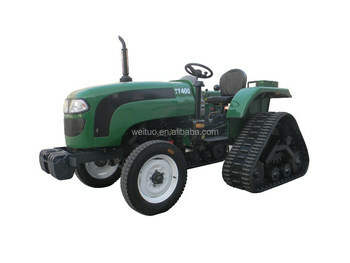 The overall size of this series of tractor is the same with the corresponding models’ except the width. Adjust theoretical speed of each shift correspondingly which is especially good for low speed driving. Due to the use of the crawler drive, the adhesion performance is significantly improved, and greatly improving the tractor pass through ability, it is especially suitable for pass through soft, muddy, slippery, snow field and other environment smoothly. Single disc, Dry friction, Single stage, Constant engagement.